The Holly Springs Arts Council celebrated the arts with the 3rd Annual Holly Springs Community Arts Festival February 4-7 held at the Holly Springs Cultural Center. This year’s celebration was center around the theme of “Winter Blues.” During the celebration the Arts Council had planned multiple activities including classes, live auction, Art Vendor show and a gala fundraising evening with a silent auction and featuring a performance from Scott Ainslie, a delta blues musician. The funds raised will support the Holly Springs Arts Council and its efforts to promote the arts in the community. The Arts Council had planned several activities for Saturday: An Art Vendor Show, Art exhibit, and food trucks. Traveler and Belle decided this would be a nice way to spend the morning, maybe do a little shopping at the Vendor show and then enjoy fare from a food truck we had wanted to try. The Art Vendor Show featured local artists and crafters. There were clay sculptures, photography, quilts, hand dyed silks, handmade jewelry and soaps among the items on display and for sale. 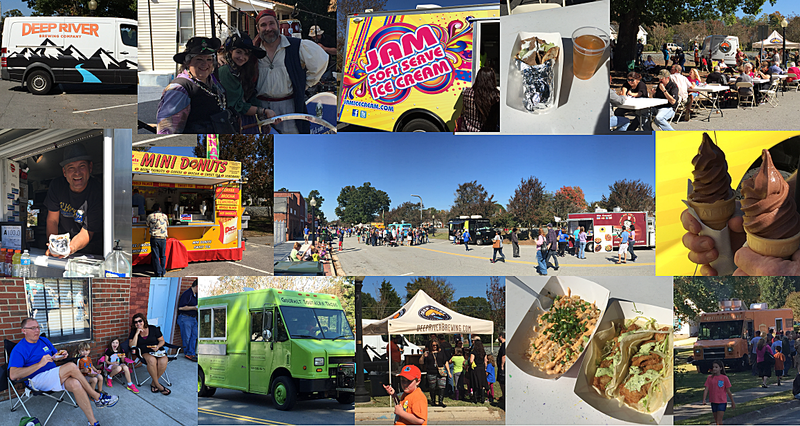 After strolling through the vendor show and enjoying the art on exhibit, we headed out to the food trucks. We found that the lines had already begun to form for the three food trucks in attendance: Dusty Donuts, Olio and Aceto and Kocina. Dusty Donuts has Hot and Fresh Mini Donuts ‘dusted’ with cinnamon sugar, powdered sugar or chocolate sugar. Olio and Aceto was offering several sandwiches including the Southern BLT with fried green tomatoes and pimento cheese. They also had Cinnamon Sugar Zeppole, a deep-fried Italian pastry filled with custard. 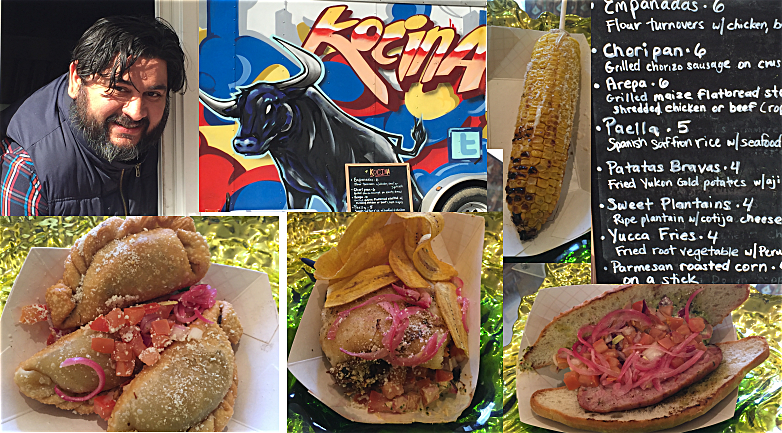 Kocina food truck features authentic homemade Latin and Spanish cuisine from empanadas to paella. In the past The Friends have enjoyed the fare from both Dusty Donuts and Olio and Aceto and recommend putting them on your list of food trucks to try. Since Kocina was on The Friends list to try, The Traveler headed Kocina’s way to make the selections for lunch we would take back so Bad Boy could also enjoy the experience. Belle also got Zeppole from Olio and Aceto for a sweet finish to our lunch. Belle and I love and support the endeavors of local artists. An Artist, artisan, artiste are persons having superior skill or ability, or who are capable of producing superior work. Based on this definition a food truck chef is an artist and this definitely describes JP Murcia of the Kocina Food truck who serving patrons at the Art Show in Holly Springs. JP was born in Columbia, South America. He lived in NYC for many years working as a Chef for NYU and other facilities in the New York area before coming to the Triangle to work for the Duke Hospital system. He worked there for seven years before becoming the Chef for IBM. He now is the owner/Chef for the Kocina Food truck. Triangle Street Eats has wanted to sample the offerings of the Kocina Food truck for nearly a year and we were not disappointed. We selected Beef Empanadas, which are a popular snack in Colombia; basically a fried meat pie. The Kocina Empanada is a tasty treat. The meat is well seasoned – not spicy, and the crust is tender and easy to eat. We would come back for more! The Arepa, is a delicious grilled cornmeal patties filled with sweet or savory ingredients. The Kocina arepa is filled with Ropa Vieja. Ropa Vieja literally means “old clothes” in Spanish. The name describes the shreds of meat and vegetables, which resemble colorful strips of rags. We found the flavor and texture to be excellent. It was one of the best I have tasted and definitely recommend it! The Choripan was chorizo sausage link split and served on crusty bread. Chorizo is a variety of heavily seasoned sausage, either cured or fresh, that is common in Spanish and Mexican cuisine. It had the consistency and taste of a Kielbasa sauce, non-spicy. The final selection was the Parmesan Roasted Corn on a stick. The corn, while hot had a great flavor, which was enhanced by the slight char and the subtle cheese. We enjoyed the offerings of the Kocina Food Truck and will return. We want to make sure we try the Paella and see Chef JP’s spin on it. Thumbs Up to the Kocina Food Truck and we recommend following them so you can sample their food.